The Dakshina Ensemble is Rudresh's col-led with Kadri Gopalnath, a living legend of Indian music known as "The Emperor of the Saxophone," a true innovator in bringing the saxophone to Indian classical music. Their work is exemplar of successful multicultural, transnational collaboration. Utilizing his extensive knowledge of both jazz and the traditional melodic and rhythmic concepts of Indian music, Mahanthappa has masterfully provided a framework has resulted in spectacular interaction and virtuosic displays from Gopalnath, A. Kanyakumari on violin and Rez Abassi on guitar. The band also features Poovalur Sriji on Mridangam (South Indian barrel drum), Carlo de Rosa on acoustic bass and royal hartigan on drums. 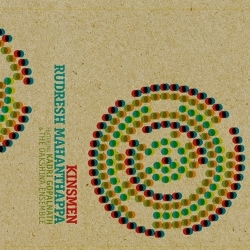 "Make no mistake, Kinsmen is a stylish and evocative blend of indigenous art forms, an extraordinarily successful East-meets-West experiment, and the most stimulating world/jazz soundclash since Ornette Coleman jammed in Jajouka." "Three things are instantly evident: the music is meticulously ordered; it has a massed density that suggests an illusory approach to free jazz; and it swings like mad."